Not too long ago, only a very small percentage of the population knew about and used the Internet. There were no such things as online businesses, WordPress, and WordPress themes. Now that things have evolved, businesses found that it’s a must to have an online presence in order to grow your clientele. Law firms and law professionals are not exceptions. Libero is a sophisticated, attractive, professional, and easy to use responsive premium WordPress theme. Libero can be a great toolkit and platform specifically aimed to help build simple and captivating business websites. Libero offers tons of advanced customizations and theme features that can be used to set up the perfect law website without touching or writing a single line of code. Test out and play with its 6 included homepage demos, various layout elements, practical pages, sidebar areas, and useful shortcodes. Maxim is an innovative, quality, promising, intuitive responsive premium WordPress theme capable of enhancing any website. This is an accessible and easy to use theme, perfect for beginners. The theme’s layout is fully responsive, and it comes with the demo content to give you a head start. Maxim includes the PSD files for those interested in the design. Regardless of your law related website, Maxim is a great platform to craft engaging and modern websites. 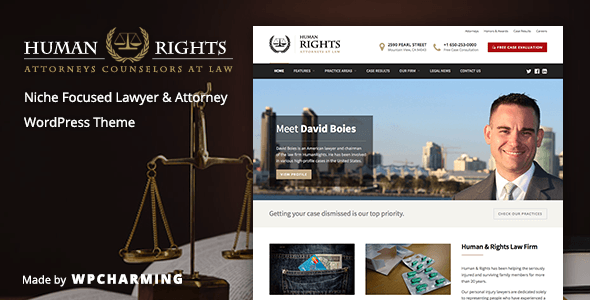 HumanRights is an attractive, dazzling, straightforward WordPress theme fitting for law firms, law practices, attorneys, lawyers, legal offices and other law related businesses or agencies. It is highly responsive and will maintain the flawless design on any screen resolution and device. This awesome and modern premium theme will allow your visitors to focus on what is important: your team, services, and portfolio. HumanRights also includes a free case evaluation form perfect for this businesses in this niche. HumanRights was designed and developed to generate more visits and clients. Attorney is certain to leave a good first impression with its modern, fresh, and appealing design. We Build is a WordPress theme that never fails to impress. This theme is highly customizable and with it you can change the blog’s layout, the header, the portfolio layout, you have an about page that includes team info, related services section, and awesome shortcodes. Attorney is also translation ready and comes with an option to turn on or off the responsive function. As you can clearly tell from its name, Lawyer is a WordPress theme developed for law firms and legal attorney websites. Lawyer has a professional and modern look that will display beautifully on mobile devices as well regardless of the resolution. 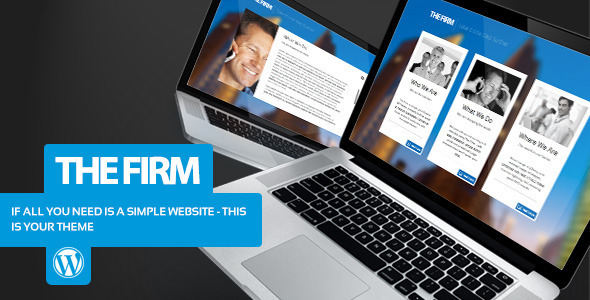 Lawyer comes packed with impressive theme features such as custom niche related widgets, call to action forms, several blog layouts, slideout forms, and 3 premium plugins. Lawyer will help anyone in the legal field to craft a stunning website to promote their business and portfolio. This next theme is an extremely modern, ambitious, attractive, clean, and user-friendly premium WordPress theme. 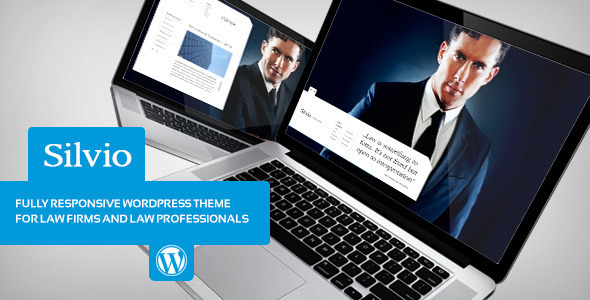 The Law Layer is a stylish theme perfectly designed and suited for law firms, lawyers, attorneys, and legal offices. The Law Layer is extremely easy to use and personalize thanks to its modern drag and drop live editor. This theme has been developed using the latest development technologies and is 100% responsive and cross browser compatible. The Law Layer is a trustworthy option for any type of law related website. 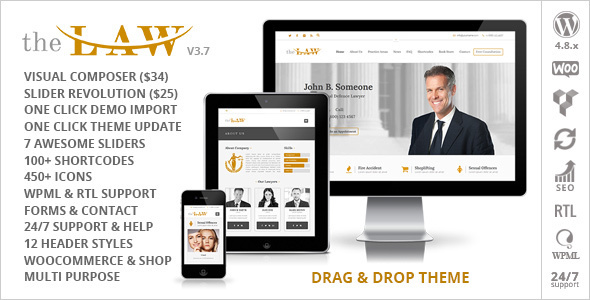 Law Firm is a responsive, premium law WordPress theme. It is a great choice for law firms and practices and incorporates multiple theme features ideal for these particular businesses. Using this theme you can have your website ready to go in minutes thanks to its one click demo installer and 3 pre-designed demo sites. The theme also includes over 30 awesome shortcodes, an events manager, sliders, unlimited sidebars and colors, 3 header styles, and many more. Try this theme out! 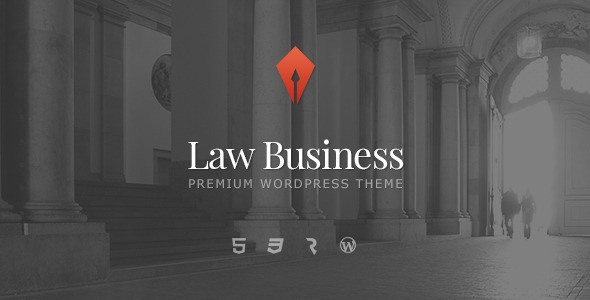 LawBusiness is a professional premium lawyers WordPress theme. This theme incorporates a powerful admin panel that will facilitate customizations. You can create a beautiful and professional website with just the theme’s features; there is no need to have coding experience before-hand. LawBusiness includes 23 custom shortcodes, several custom posts, a custom form builder tool, and custom widgets. For no extra charge, the theme also comes bundled with 2 premium plugins: Layer Slider and Revolution Slider. 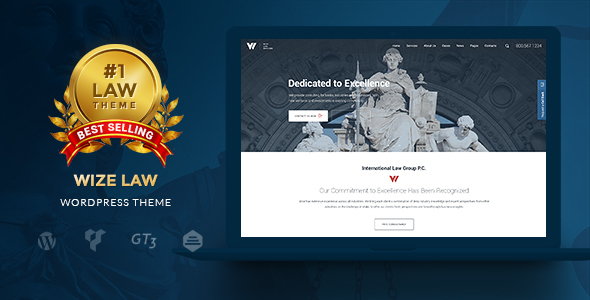 WizeLaw is the number one best-selling premium law WordPress theme, according to their ThemeForest page, and it is not hard to see why. It has a refined, creative, and visually intuitive design that will help you turn visitors into clients. WizeLaw is packed with Visual Composer for visual editing page layouts, the GT3 photo and video gallery plugin, slider revolution, a powerful Instagram feed, and a header builder. This theme is extremely intuitive and customizable so stop second guessing and give it a shot. 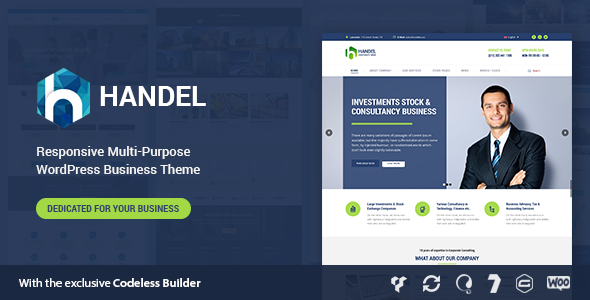 Handel is a stunning, robust, multipurpose and responsive WordPress template. Handel is responsive, cross browser compatible, retina ready, and offers a bunch of features. By choosing this amazing theme you will benefit from over 200 content blocks templates and custom elements to design the perfect business website. Additionally, Handel comes equipped with a page builder and various premium plugins. With Handel you will be able to create a clean and professional look for your business. Law Practice is an awesome, clean and aesthetically pleasing, responsive lawyer WordPress theme. This theme was designed and developed to meet the expectations of any professional legal business. 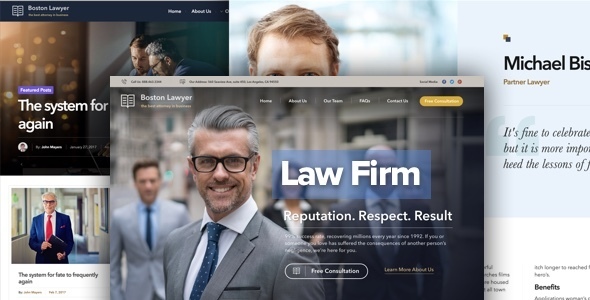 Law Practice offers a great range of features and tools to design and develop the perfect website, as well as maintain it and conduct it after it’s finished. The theme’s initial setup takes mere moments and you can also select to import the demo content. Moreover, Law Practice is translation ready and comes bundled with 2 powerful premium plugins: Slider revolution and visual composer. Wish is a superb, professional, stylish, modern, multipurpose responsive WordPress theme. Wish will make the development of your professional website a piece of cake, without resorting to coding or web developers. Wish comes integrated with a slightly altered Visual Composer page builder that allows you to see all the Wish elements before adding them to your page’s layout. This allows you to see in real time the changes you make and select the best one. Additionally, Wish comes with several demo homepages especially designed to showcase the design elements used and the content. 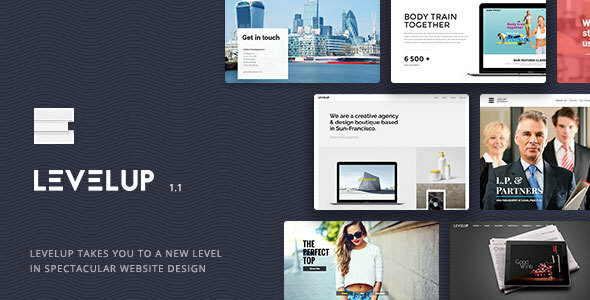 LevelUp is a multipurpose theme created by an Elite Author and sporting a 5 stars rating on ThemeForest. It’s a fairly easy to use theme quite adaptable to all types of professional websites. LevelUp comes with more than 60 pre-made demo sites and pages that can be easily installed and used through the theme’s one click demo installer. By checking out the live preview of the theme you can test it out before purchasing and see what more it has to offer. 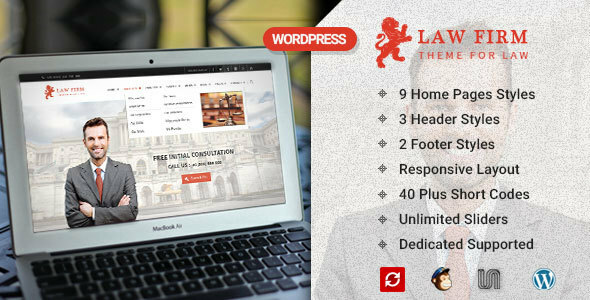 LEX is a professional, reliable, contemporary, sleek, premium WordPress theme designed for legal offices and businesses. It is a great platform to implement a unique, stunning, and appealing professional website. LEX is incredibly fast, responsive, translation ready, and has a bunch of intuitive features and design elements ideal for beginner users. LEX comes supplied with 10+ custom widgets, custom post types, 2 blog layouts, 4 practice area, and 4 case results. 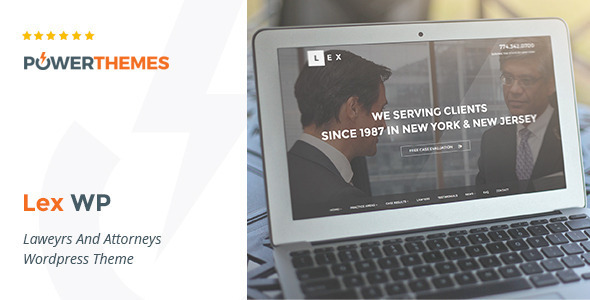 With LEX you can easily show off your services and portfolio in order to entice new clients. 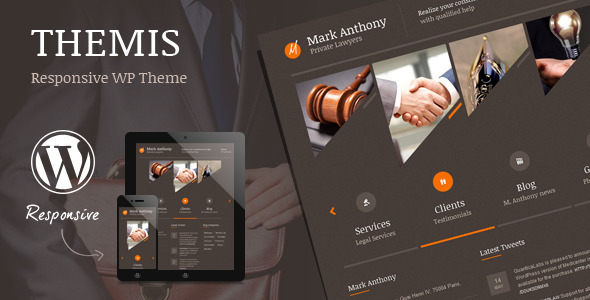 Themis is an eye-catching, impressive, easy to use, and beautifully designed WordPress theme ideal for law firms and offices. With it you can have a complete website in minutes thanks to its demo installer. Use one of the already built 20 page layouts to showcase your portfolio and company and give visitors easy access to your most relevant information. With this theme you can create your own style by using the unlimited color schemes and 800+ Google fonts. All the theme’s customizations can be found in its admin panel that is extremely intuitive and easy to use. 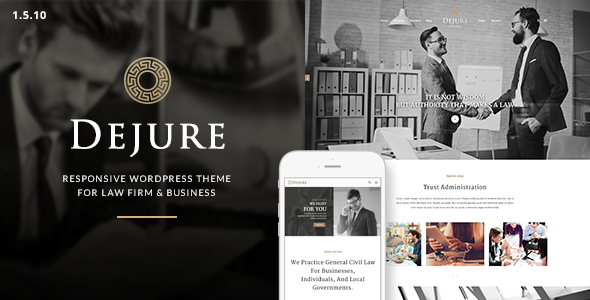 Dejure is a robust and modern premium responsive WordPress theme for law practices and businesses. This theme is the ideal platform for crafting potent, engaging, and professional law websites. Dejure is extremely flexible and you can design beautiful layout with its features. It comes with Revolution slider and Visual Composer so you can accomplish an eye-catching design. Dejure also includes a portfolio shortcode that will beautifully display your previous work. You can also showcase your testimonials in an elegant and modern layout. 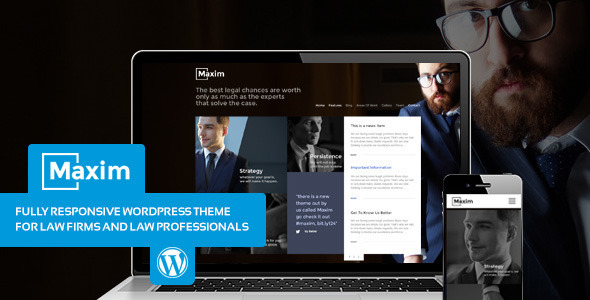 Silvio is a robust, modern, and clean WordPress theme suitable for law firms and law professionals. 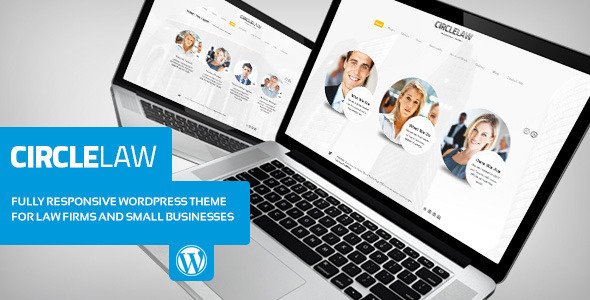 This theme will surely help you promote your business and services. Take advantage of Silvio’s features to enhance your website’s design and influence your visitors to choose your services. The theme is fully responsive and it will look amazing on all sorts of devices. With Silvio you also get a complete documentation and several video tutorials. This multipurpose, fast, intuitive, and responsive WordPress theme is, as the name suggests, about you. It was crafted by developers with a specific goal in mind: to be extremely easy to use while having a bunch of features adaptable to all niches. You is mobile optimized and looks just as good on all devices and browsers, it is very fast, has various pre-made page layouts, and includes real content demos. You also comes with unlimited header options, a few premium plugins included, and a powerful skin creator. 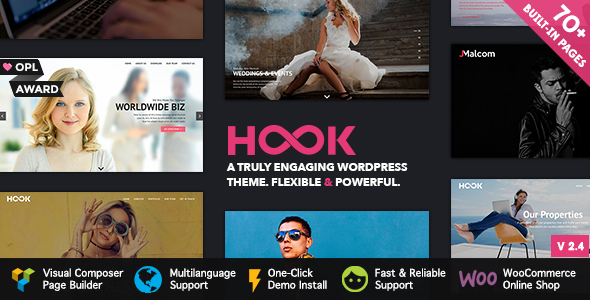 Hook is a clever and superior WordPress theme packed with tools perfect for crafting a professional and functional website in minutes. It comes with over 20 flawless pre-built demos you can choose from, or you can create your own design by using the Visual Composer page builder. Hook also features more than 70 page layouts, a footer builder, unlimited sidebars, various page elements, and RTL support. Hook provides the perfect platform to promote your business through visual stunning elements and engaging content. This premium law WordPress theme is extremely reliable, fast, and stunning. With Justice you cand develop beautiful, unique lawyers, attorneys, and legal websites without the help of a professional. 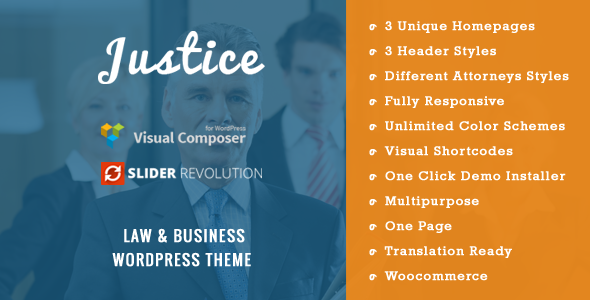 Justice comes with two powerful premium plugins: Visual Composer and Revolution Slider which allows you to craft unique page layouts. Justice also includes 3 homepage demos, several lawyer styles, unlimited color options, and 3 header styles. 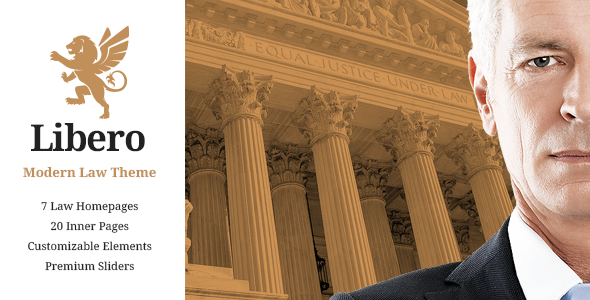 Justice is a great solution to making a beautiful and functional law related website. 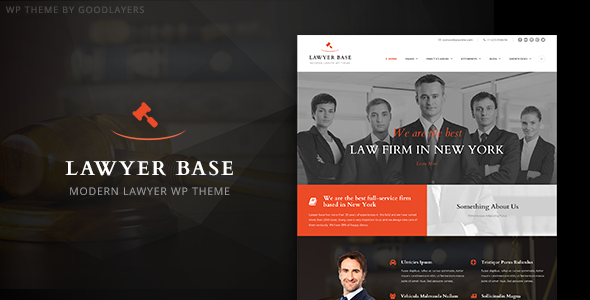 Lawyer Base is a responsive premium WordPress theme ideal and dedicated to law firms and businesses. 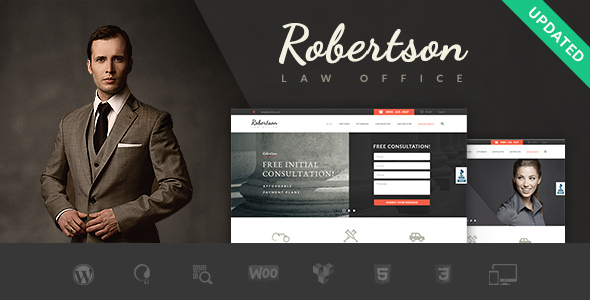 Lawyer Base comes with a fully responsive layout that will adapt perfectly to any device used. By using this law firm WordPress theme you will benefit from awesome custom niche related features. 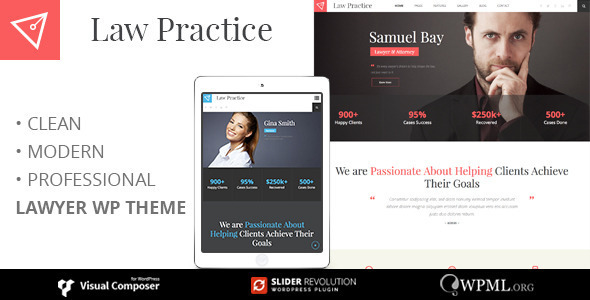 Lawyer Base comes with Master Slider and an integrated page builder. Apart from those, it also has lawyer and attorney post types, practice areas, project layouts, mega menu, am fully supports WooCommerce and WPML. Law Office is a marvelous, versatile, fresh, and contemporary law WordPress theme. Law Office will provide the perfect platform for developing a beautiful and enchanting website suitable for legal businesses. Law Office does not hold back when it comes to theme features and with it anyone can craft appealing layouts. It offers a feature for online appointments so your clients can reach you easily. Its interactive Ajax search option is a welcomed addition to any website. Law Office also comes with a rating and review manager. 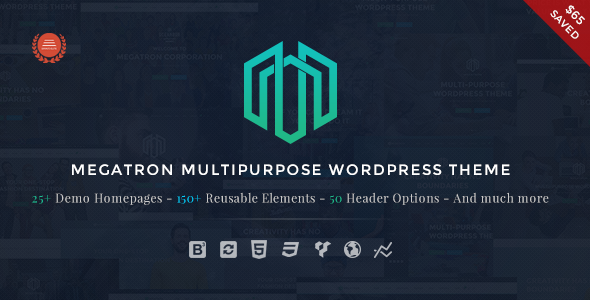 Megatron is a fully responsive, clean, stylish, multipurpose WordPress theme perfectly capable of adapting to personal or professional websites. It includes over 25 homepage demos designed for various niches. Megatron is a truly versatile multipurpose theme full of features for different business sectors. It comes packed with Visual Composer, Revolution Slider, and the PSD files. Apart from this, Megatron is optimized for speed and it is 100% responsive. You can play with its impressive features through the powerful admin panel. With an impressive rating of 4.87, Lawyers is easily one of the best choices in templates for a law related website. 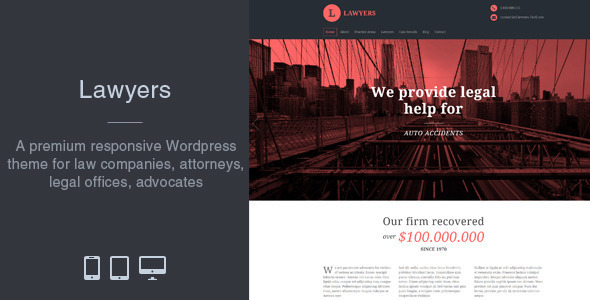 Lawyers is a premium WordPress theme that is feature-packed, eye-catching, intuitive and user-friendly. You can see from its design and Lawyers was developed to be a complete platform for the specific requirements of law business websites. This theme’s homepage is created with the help of stunning custom widgets that you can control and customize. In also offers 2 different choices for the header and footer. Check out its live preview and documentation to find out more about Lawyers! The Practice is a beautifully designed and professionally developed theme perfect for the construction of a stylish and modern business website. The developers really outdone themselves with this theme and managed to craft an efficient and intuitive platform. The Practice comes with an impressive set of tools such as an advanced page builder, demo content installer, multiple sliders, unlimited color schemes, various shortcodes, and a mega menu. Use these feature to simplify your work and engineer a simple and eye-catching layout. The Practice is fully responsive and retina ready and it will look just as beautiful on all browsers. Try The Practice now! 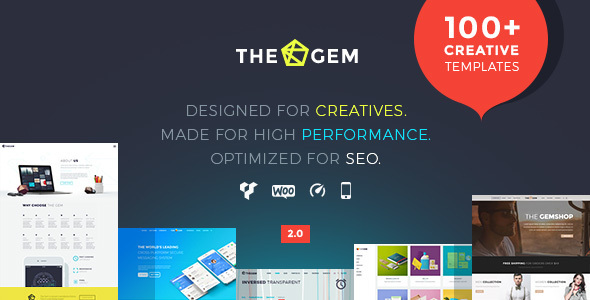 TheGem is an awesome multipurpose, robust, professional, and responsive WordPress theme. You can tell by its incredible design and features that the developers of this theme were trying to create something unique and useful. TheGem comes with an impressive number of prebuilt demos, including a couple for lawyers and law related companies. TheGem is a great platform for this niche because it offers ample niche related features. Using the theme’s professional and gorgeous layout you can showcase your best work and keep visitors engaged and interested. Lawyers have one of the most rewarding jobs out there, and their business along with their website must be of a certain quality in order to inspire others to give you the change to represent them. The Firm is a great choice to help you achieve that. The Firm is a great portfolio theme that will fit your needs showcasing your work, team, and services. To give you even a better chance to have a powerful online presence, this theme is SEO optimized and fully responsive. For more information, check it out! This amazing template is a one-page retina ready, fully responsive lawyer WordPress theme. Lawyered Group will give you a fighting chance among your competition and help you develop a successful business. To use Lawyered Group you do not need to have extra knowledge because it is very intuitive and comes with an admin panel that will allow you to personalize and customize your website in minutes. Build your page layout however you want with these sections: home, about us, our services, our team, case studies, and contact information. 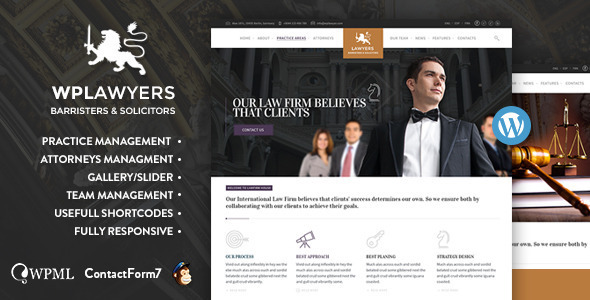 Law Practice is a beautiful, flawless, versatile lawyers WordPress theme. Whatever legal business you have, Law Practice is the choice for you. This theme was developed with useful features for this specific niche such as practice management, attorney management, and team management. It also includes the demo content and layout fully designed for the needs of this niche. Law Practice supports free or premium translation plugins such as WPML and/or q Translate. In this niche, the way you present your services and portfolio is important and you need to take this into consideration when choosing a lawyers WordPress theme. CircleLaw is capable of reflecting professionalism and standards through its design and functionality. You do not need coding knowledge or any special training to be able to use this theme and fully take advantage of it. CircleLaw has a responsive design, comes packed with useful shortcodes, and an extensive documentation. To find out more information about the theme, check out their live preview and screenshots. 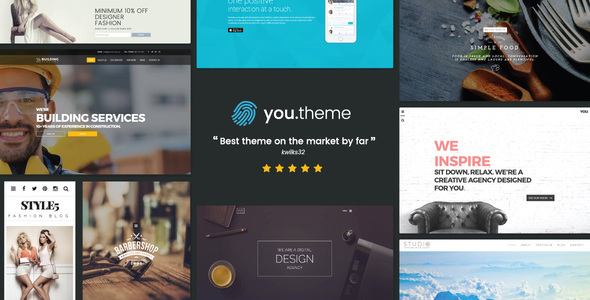 These diverse, premium, best lawyer WordPress themes are more than capable to give your website an edge over your competition. Simply select the one that will match the most with your business ideas and vision.